leaves in Lake Superior Provincial Park, Ontario. We spent today exploring various waterfalls and trails in Lake Superior Provincial Park including Sand River and the Pinguisibi trail which were relatively close to our campground. After a short walk from the car park at the beginning of the Pinguisibi Trail, we found a large waterfall which cascaded down an escarpment in several rocky steps along the Sand River. Although now the autumn colours are beginning to fade out as winter begins to take hold in Ontario, we found a few trees still clothed in yellow or fiery red. 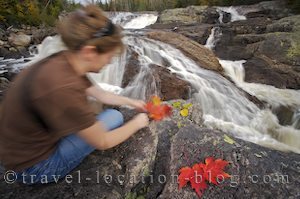 We stayed at this location for around two hours and fought with the wind (created from the waterfall as well as being channeled through the river valley) which was trying to blow the leaves off the rocks after we'd set them up for a shot. Further along the trail a shallow, still pond reflected the forest canopy and sky on its surface which was also partially covered with colourful leaves. We were in heaven!! Fresh clean air, nature and wilderness, peace and quiet - and it was so nice to have the time again to be creative - even if the weather didn't co-operate completely (it was a little on the gloomy side). After several hours we returned to the camper at Agawa Bay and noted a few extra people had arrived - probably to enjoy one of the last nights in the park before it closed for the winter.